I enjoyed this book because its ridiculous plot teaches a valuable lesson, which makes both the story and its theme more memorable for all who read it. Imogene's Antlers has a simple message: everyone is different, but even the things that people think are "weird" about you can be useful. If Imogene can use her antlers to help out around the house, then children can learn to be proud of the traits that make them unique and can positively impact themselves and others. The illustrations in this book are very beautifully drawn, and they convey the emotion of every character on every page without the author having to tell you how they felt. From the chaotic, childlike harmlessness of Imogene and her brother, to the distraught attitude of her parents and her principal, to the delight of the maids, and even the sneaky nature of the cat who wanted to steal the doctor's sucker, the detailed expressions add a level of depth of understanding in regard to the character's emotions. Although it would be nearly impossible to forget about Imogene's impressive set of antlers, the ending of this book is even more impressive when Imogene wakes up with peacock feathers! This is a great source for parents and teachers to help children practice making predictions or telling stories, as you could ask readers to predict what happens after she grows her feathers. Overall, I enjoyed this silly, simple plot, and the youthful illustrations, as they provide for a good read and an even better message! Today was the first time I'd ever read this book (and the second and third too). The boys thought is was "so funny". For some reason they think fainting is the height of humor and thought it was hilarious that the mom faints three times in the book. The illustrations are fantastic and the story is fun. They had a great time making up all the things that would happen to her in the following days. The best one was "nacho ears with salsa dripping from them....but it would hurt if someone tried to eat them. "A great little book to read with your littles. But even my bigs liked it. Imogene's Antlers, by David SmallThis book is about a girl who wakes up with antlers on her head. Her whole family is in dismay as the see her walking down for breakfast. They try and cover the antlers up, but find it is impossible. Then, others around her find good use of her antlers, and make the best out of them. When the girl goes to bed, she wakes up without the antlers. Her family is excited, but then, to their surprise, she has peacock feathers behind her!This children's book has a hidden message. I think under the funniness the book offers, it shows that it's okay to be different, and even if people don't accept you at first, others will find your strengths that you have about yourself! This story is good for all ages, but probably more so for the younger grades. It will definitely keep them entertained as the book does a great job with its use of words and illustrations. The pictures go hand in hand with the content, and there is plenty of detail. This book doesn't really have any cultural diversity, the characters within this story are white. From the pictures though, it looks like the little girl comes from an upper class family with a nice home, hence why her family tries to cover her antlers up. What a blast from the past!! I saw this off on the side of recommendations, but I hadn't thought about it in years. I need a re-read for a proper rating and review, but I do remember this fondly. I think this story is pretty cute. It's simple and just plain odd. I can imagine a kid would get a kick out of it. It is a picture book, so of course there is no in depth explanation of how she got antlers. But as an adult, you've got to wonder how it happened and could it all be in her imagination or a dream? I'm not sure why everyone adores this book, it was just kinda silly to me. But kids seem to love it. Considering how old this book is, the great part about it is how it feels current. It isn't dated at all. Wonderful having Kiersten read this one. And the idea...I loved it.5/11/10 & 5/13/10 This was a PERFECT read for preschool storytime. I don't know how I'd forgotten it before now. It was excellent on Tue. because the length and story were better choices than the other 2 I had picked. Thu. group was rather low-key, but I think they still liked seeing this girl with antlers.4/11/12 My opener of "That's Silly" theme, this definitely set the tone. I tend to have a younger preschool crowd, so some of the words in this were unfamiliar. I explained a couple. Two older girls helped get the crowd into the book. Adults definitely enjoyed it. Everyone loved the end.2/19/14: Part of my "That's Crazy" theme. Kids loved it, especially the doughnuts part. They also loved the ending. In this quirky tale a girl wakes up one morning with antlers, the doctor and the principle are called to advise, her mother faints repeatedly, and her brother declares her a “miniature elk.” The antlers become quite useful as drying racks and candleholders. A huge hat is custom made to cover up the antlers but fails to meet the approval of mother. All is well the next morning as the antlers are gone but wait there’s a new surprise. 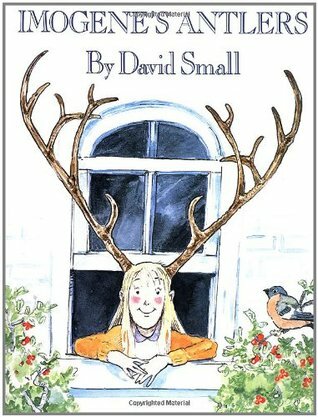 David Small illustrates this tale in soft warm shades but with very poignant facial expressions especially that of the principle upon seeing Imogene’s antlers. My favorite spread is that of Imogene sliding down the winding stairway with details marking texture and movement in the drawing style. Lauren's Review:I read Imogene's Antlers by David Small on February 5, 2012.1. What was your favorite part of this book?When Imogene fed the birds with the doughnuts stacked on her antlers!2. Was this book funny, sad, silly, or boring?It was a fun book.3. Who was your favorite character?Imogene, the girl who had the antlers grow out of her head.4. Would you tell your best friend to read this book?She should. I found a lovely 1985 edition of this book without any markings or damages whatsoever. Those who follow Mr. Hankins know that he is a huge David Small fan, and when David talked about his book in the new documentary, LIBRARY OF THE EARLY MIND, I jumped at the chance to find this book. Imogene awakes one morning to find that she has grown antlers on her head. The members of her extended family all have various responses. . .and ultimately, creative solutions to Imogene's new head gear. Whimsical story telling with Small's classic characterizations, Imogene's Antlers would make a nice picture book "ladder" to Kafka's THE METAMORPHOSIS. Mi-a fost interesant felul în care Imogene, o fetiță de vreo 10 ani, a reacționat la faptul că i-au crescut peste noapte ditamai coarne de cerb. A acceptat acest lucru ca pe o glumă, sau o aventură. Ca și metamorfoza de la sfârșit. Faza cu "going trough a door now took some thinking" e tare. De fapt, cu excepţia mamei care mereu leşină şi a directorului de şcoală care a privit urât, toată lumea din jur pare curioasă sau amuzată. Those antlers are amazing. And Imogene keeps such a great attitude--I love the way she feeds the birds. I just wish I could ask David Small if her name should be pronounced Ima-jean or Ihm-o-jean. I don't know why, it just bugs me not knowing. I called her "Ihm-o-jean" forever and ever, and then I heard someone else read it the other way. Does anyone know David Small personally? Would you ask him for me? This is a very funny story about a little girl who grows antlers. The narrative is simple and the illustrations are great. It has an old fashioned feel to it, which makes sense because it was written in 1945. Our youngest listened to this book read on audiocassette in the car four times straight and loved it. The surprise ending really did it for me. Kind of like "Bark, George." Been a long time since I last read this one. Reissued for 25th anniversary of publication. This was my read out loud book. I picked it because I thought the kids would get a catch out of a girl with antlers. It also made you think what will she do?? Life is easier when you make the most of what you've got.This girl named Imogene wakes up, finding that she has grown these massive antlers. Every time her mom sees her, she basically faints. They have the doctor come look at her, which, you know, is a reasonable thing. The first part of the story is basically the family trying to figure out why it happened. Her brother says, according to the encyclopedia, that she has turned into a rare form of miniature elk, which causes the mother to faint again.Then people find utilitarian things to do with her antlers. It's kind of cool. Her mother declares that they have to get a hat to hide her antlers under. They get a milliner to come by who makes a hat immediately, just a giant bonnet that covers her antlers, and her mother hates it. Then Imogene goes to sleep, and the next day she wakes up without antlers, but she's got a peacock tail.I think this book's message is, "Embrace differences." Basically, her mother is the only one that's got a problem with it (well, and the school principal, who is shown as glaring at her but having no advice to offer). It's like, so what if she's got antlers on her head? She just takes it like a champ, just keeps going and finds all kinds of cool things to do with her condition. She has her piano lessons where she's got her antlers bedecked in candles. It's great, and she looks pretty happy with her peacock tail at the end, too. It doesn't seem to be a metaphor for self-expression, but she is never shown as being upset that she has antlers. She either just takes it in stride or is completely thrilled about the whole situation, which is great. Only her mother is upset, everybody else is just kind of there watching this unfold. And the illustrations are great, too, with the other characters coming up with ideas like putting donuts all over her antlers and sending her out into the garden to feed the birds. There's a lovely picture of her covered in doughnuts and birds of all different kinds sitting on a bench outside. The book is basically saying, "Some people are different than other people and it's okay. You don't have to be upset that you don't fit in. "It's just wonderful to see somebody being happy with their differences rather than being upset like so many other books. So much of reality is people being told, "You can't do that" or "You can't be that way," and this girl is just like, "I am that way, so deal with it. This is who I am now, and I'm proud of it. "Message: Differences are something that can be celebrated.For more children's book reviews, see my website at http://www.drttmk.com. Summary: Imogene wakes up one day with a set of elk antlers. She goes about her day doing crazy things with them, her mother fainting at the sight, and then trying to cover them up. By the end of the story Imogene has lost her antlers when she wakes up the next morning, but realizes that she now has peacock feathers instead.Evaluation: I really like this story and how creative it is. It is definitely a story that will keep your students attention with them asking what will happen next and laughing about what Imogene decides to do with her antlers.Teaching Idea: For this book I would have my students make predictions about what she will do next with her antlers as I read the story aloud to them. In addition to that I would have them predict what will happen to her next, since she lost the antlers, and then gained peacock feathers. I would have the students then do an independent creative writing activity on why they think their prediction will happen next and what will Imogene will do because of it. This was one of my favorite children book my mother use to read to me, and something I learn to read on my own. It's a cute book explaining how Imogene learn how to deal with changes in her life and make the best of it. This something to teach children on how things can unexpectedly chance overnight. One day Imogene finds something very odd about her head. There are antlers on top! She tries to adapt to this new change in her life, but will they go away eventually? Or will they stay there forever? Fun tale of a girl that wakes up with Antlers! A reread for me. My biggest take-away from this book is how well-paced it is. So imaginative and worth rereading again and again. Nice, funny. Only have slight age feeling as this book was illustrated long time ago. David Small - Librarian Note: There is more than one author in the Goodreads database with this name.David Small is the recipient of the Caldecott Medal, a Christopher Medal, and the E. B. White Award for his picture books, which include Imogene's Antlers, The Gardener, and So, You Want to Be President? He lives in Mendon, Michigan.